Your passion for the earth and its resources is clearly shown with the presence of our official RRRM* plate showing the recycled content amounts from 25% to 100%. Attached to the back or on the bottom of items ordered from Haertling Awards. *RRRM (Recycled, Reused & Reclaimed Materials) plates are provided at no charge if content is +25% RRRM Content. Plate size: 2" x 2", or smaller if needed. Platinum and Silver level plates are silver, Gold level plate is gold and Certified level is Copper. RRRM levels for individual items on this website are not listed due to the changing availability of recycled materials. RRRM levels for specific products are available by email jhaertling@msn.com, or by filling out the Order Form. Plates are available upon request. Please ask to have the RRRM plate added to your items when you place an order. 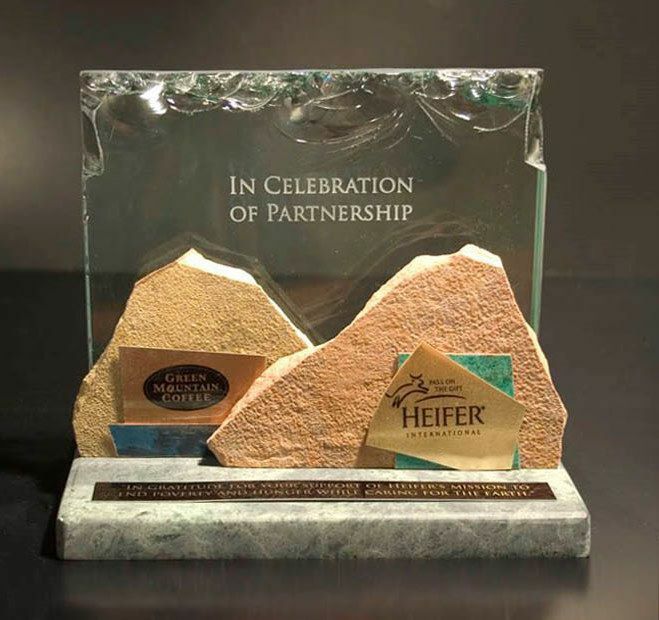 Heifer International uses Haertling.com gifts as a way to say thank you to donors with the message "In gratitude for your support of Heifer's mission to end poverty and hunger while caring for the earth." It was made using reclaimed materials, including discarded, heavy, tabletop glass and recycled, green marble, counter top scrap from construction recyclers. Heifer International provided the wording and graphics for this "custom recycled content" plate used on the back surface of their donor gifts. John Haertling started using recycled materials in the early 80's using discarded flagstone from Boulder's city streets that were being resurfaced. Later, after working for his architect father, Charles Haertling, he soon added a stock of roofing copper which was leftover from one of his dad's projects. www.atomix.com. The NOVA award plaque, which is given by The Community Foundation to non-profit organizations in Boulder County is made from flagstone pieces gathered on private land of a 100 year old stone quarry near Lyons, CO.
Wood from an eighty year-old fallen tree from Boulder's open space becomes a base for the Pacesetter Awards given by the Daily Camera for significant contributions to the community. Gold and silver plated copper, originally made to be part of a million-dollar data storage device for StorageTek, is now an ornament which abstractly represents alternative energy production processes on a service award for dedicated scientists and staff members at the National Renewable Energy Labs (NREL) in Golden. Non-recyclable thick colored glass from a Denver bathroom fixture manufacturer now sits in the main office of Motorola Corporation in Schaumburg Illinois, rather being in a landfill in Denver. White marble discarded from the fa�ade of a downtown Denver landmark piled up in a construction site refuse container until John got permission to keep it in the system rather than in the landfill. John reclaimed 45-year-old redwood seat planks from Red Rocks Amphitheater that were being replaced by new material. He utilized the wood to create 120 gifts for performers of the 2008 summer season of concerts at his client's request. 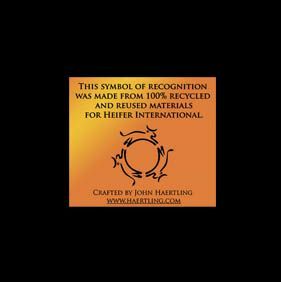 Everyday Haertling Awards also uses recycled boxes and packing materials that are gathered from local collection sites and material handlers. Do you have some materials that are precious to you or which were saved from a special place? John invites you to supply your own materials for him to work with, allowing you or your organizations the chance to create your own historic chain that links personally meaningful materials with awards. More than half of Haertling.com's customers are non-profit organizations. A customer once told John "people who do good work look to work with other people who do good work." As John says, "I consider it a compliment and a privilege to work with these groups. I work with their budgets so they can continue to do the great things they do." John's intention is to share the message of caring, hope and participation in what he believes is the "good of all", while embracing the earth and the ways we touch it. With his strong value of fairness and diversity, John strives to incorporate the symbols that unify us as a population.